The storage of compressed gas cylinders to comply with Federal, State and Local regulations often presents a number of problems. These new cylinder storage racks can help organize your cylinder storage and help you comply with the myriad of regulations. Because the frame is predrilled to accommodate anchoring the rack to the floor they are ideal for situations where cylinder must be located away from a wall or other securing fixture. Racks are available in standard sizes to hold one to nine cylinders. Custom racks are available. Standard rack configurations are shown below. The unique design of square steel tubing (2” x 2") components welded together to form the frame provides the rigidity necessary to allow the frame to be constructed without a bottom. This allows cylinders to be rolled into the frame without lifting. Racks are provided with either single or dual restraint steel chains to secure the cylinders. Single restraint racks secure the individual cylinders with a chain for each cylinder located at the top of the rack. 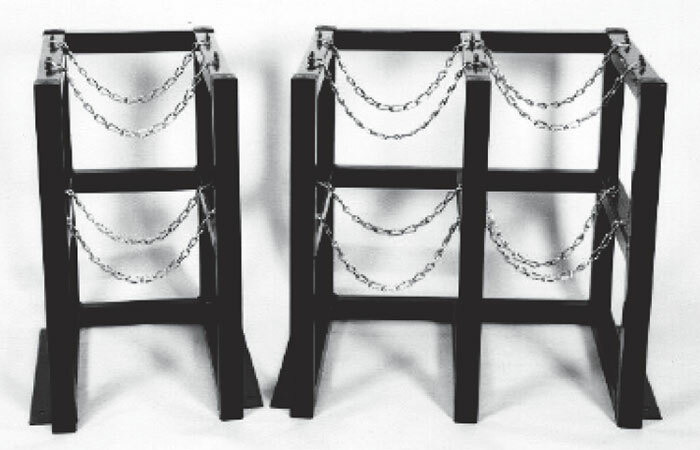 Dual restraint models have a set of chains for each cylinder at 15" and 30" from the floor. Racks are finished with a black powder coating to provide long lasting protection. These cylinder storage racks meet the requirements of the National Fire Protection Association, National Fire Codes, Uniform Fire Codes, Uniform Building Codes and Seismic Zone 4 Restraint Regulations, Compressed Gas Association, and OSHA. All cylinder racks must ship motor freight.